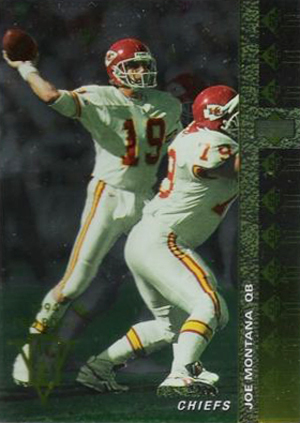 For its sophomore effort, 1994 SP Football continued to push the super premium limits of the day. However, a lackluster rookie crop has kept prices in check over the years. Shifting to an all-foil design, 1994 SP Football base cards look very similar to those found in 1994 SP Baseball. The dark look is largely dominated by an action shot. A stripe runs down the right side of the card with several SP logos and an Upper Deck logo. The player's name and position run vertically along the top of the stripe. Team names are in small white text at the bottom of the card. The 200-card checklist kicks off with 20 Premier Prospects, rookie cards from the game's top first-year players. 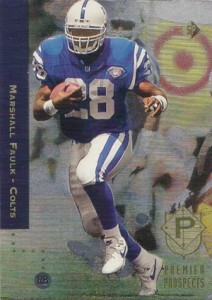 Leading the way is Marshall Faulk. From there, it's a steep drop with Trent Dilfer and Heath Shuler leading the second-tier rookies. Premier Prospects have a different design. They use an upgraded etched foil background. A subset foil logo in in the bottom-right corner. A solid-colored stripe in the top-left has the player's name and team. A dotted line leads to a small circle with the position. 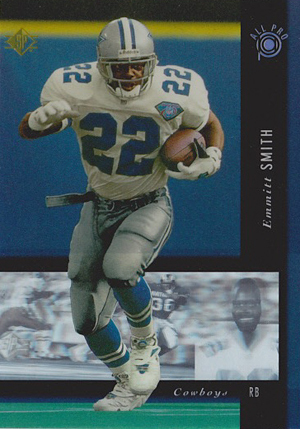 The 1994 SP Football base set is paralleled with a series of Die-Cut cards. These fall one per pack. All-Pro Holoview is the main inserts in the release. The 40-card set is highlighted by a rotating hologram at the bottom of the card. The checklist includes the NFL's top players of the time as well as a handful of rookies. Regular All-Pro Holoview cards are inserted 1:5 packs. However, it's the All-Pro Holoview Die-Cuts that are the most popular cards in the set. Inserted 1:75 packs, the cards have an arch cut from the top. 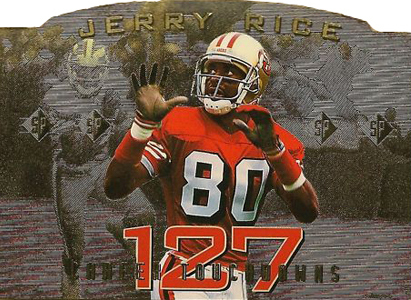 Dan Marino and Jerry Rice each have a rare die-cut Record Breaker card. These gold-themed cards honor career milestones. 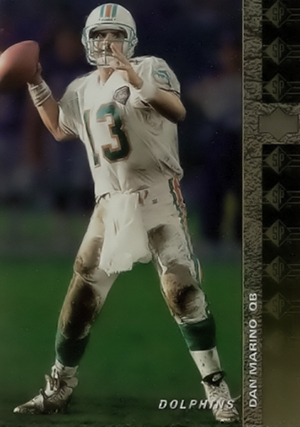 For Marino, it's his 300th career touchdown pass. Rice's 127th career touchdown is celebrated. 1994 SP Football boxes come with 30 packs of eight cards. 1994 UPPER DECK SP DIE - CUT # 88 Joe Montana PSA 10 GEM MT PSA # 26355893 HOF ! Now that the 2012 NFL season has come to a end, I’ve noticed that the 2012 football sets are slowly but surely ending as well. This break has led me to products like 2013 Hit and Leaf with its 2013 rookie class. I have been going back in time to sets like this. I had several inserts of reprints in my 2012 Upper Deck SP Authentic. Hence my joy at finding this ’94 complete set at my local sports card store “Collectors Palace”. I got this set at a great price point at $10.00! The card stock and print on the ’94 SP are a pleasure to view, of course my reason in purchasing this set is all about some of the key cards, Faulk, Marino, Elway, Montana, and my favorite NFL Player Brett Favre! Sets like this are inexpensive at best. Without going into debt, sets from the ’90s not only educates me of the players but allows me to keep busy until the start of the season! Now, the question is; “What’s my next purchase”!